This Neon Glow in the dark body paint is a must-have for your next outing, whether you're going clubbing, to a party, or concert! When viewed in normal light, Neon Glow body paint looks like normal paint. But when you turn out the lights and flip on the blacklight, this body paint takes on an incredible eye catching glowing effect! Neon Glow fluorescent paint is safe for use on your body and your face, although it's not recommended for use on the skin around your eyes. This neon paint can even be applied to other surfaces, such as clothing, paper and wood. It's water soluble and doesn't stain, so you can get super creative with these UV glow paints. 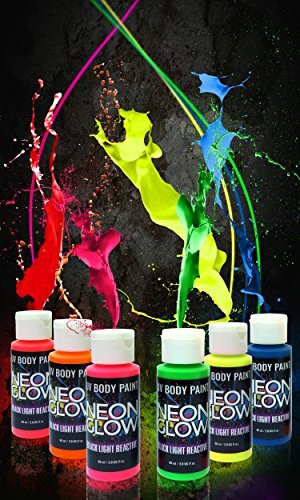 This fluorescent blacklight body paint is perfect for the night club, EDM music festivals, concerts, raves, blacklight parties, Halloween celebrations and beyond. Please note that this neon body paint requires continual exposure to a blacklight in order to glow. Get your six pack of Neon Glow in the Dark Body Paint today and create some incredible blacklight designs! Neon Glow is not intended for use on the skin near the eyes or mouth, as it is not intended as a cosmetic. It is a non-permanent, non-toxic, water-based paint that is semi-washable and will come off skin and hair with soap and water unlike an acrylic or permanent paint. We strongly recommended that you do a small test pattern on the desired area to check results before mass usage. If allergic to preservatives (such as those found in shampoo) or acrylic type substances you should not use this product without proper consent. BRIGHTEST GLOW PAINT YOU HAVE TRIED! - Just look at what customers say...No more glow paint that leaves you wondering where is the "pop"? Just fire up the UV light and your kids will steal the show at their next glow in the dark outing! GREAT PRICE AT $2.50/OUNCE! Compare to other sellers at $8.45/ounce and $4.48/ounce. SAFE & NON-TOXIC!! -Neon Glow Body Paint is ASTMD-4236 certified, which means that you don't have to worry about the safety of your children or their long-term health when using this product. EASY TO WASH OFF AND DRIES QUICKLY! -When applying Neon Glow it won't keep you waiting forever for it to dry and when you are done it will come off so easily you won't believe it! Our customers comment about this all the time. Also, check out our other color option with White, Purple, and Brown in the dropdown to the right. WORKS OR YOUR MONEY BACK! - We back our products up with a 90-day hassle-free money back guarantee. There's no risk when you order now! If you aren't completely satisfied, simply contact us and we'll give you a full refund, no questions asked (you don't even have to return the product). Our #1 priority is to make sure our customers are completely happy. If you have any questions about this product by Neon Glow, contact us by completing and submitting the form below. If you are looking for a specif part number, please include it with your message.